Note: Be sure to scroll down to the readers' comments section; a reader has provided additional information and a theory as to Jennie's identity. 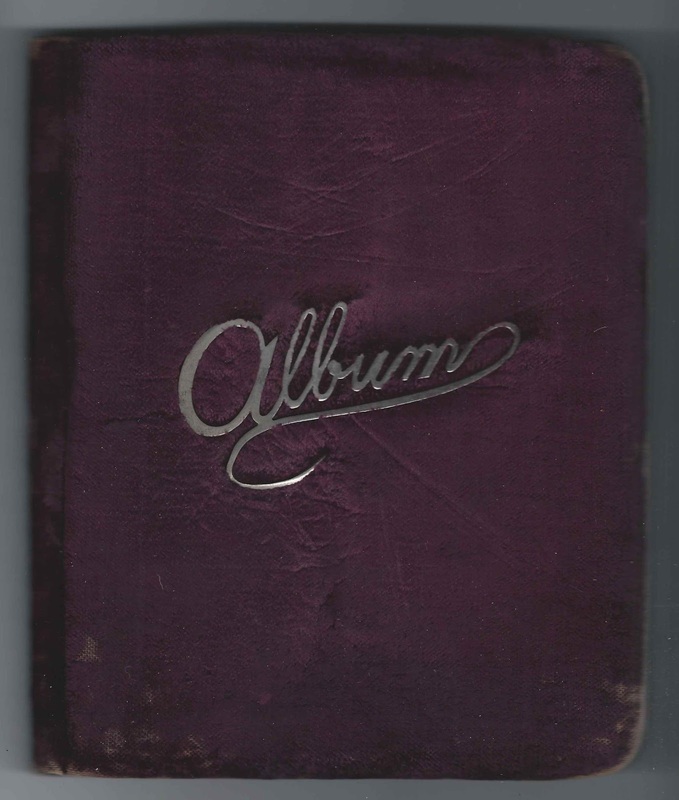 1880s autograph album that belonged to a Jennie, who I believe to have been a student at the Luther V. Bell School and then Somerville High School at Somerville, Massachusetts. It's possible that she may have been a teacher rather than a student. She tucked what appears to be a sprig of lily of the valley in her album. The album is approximately 8" x 6-3/4" and contains the sentiments of 30 students and teachers. An alphabetical list of the signers appears at the end of this post. Teacher Emma Schuh of Somerville, Massachusetts, painted a spray of pansies. 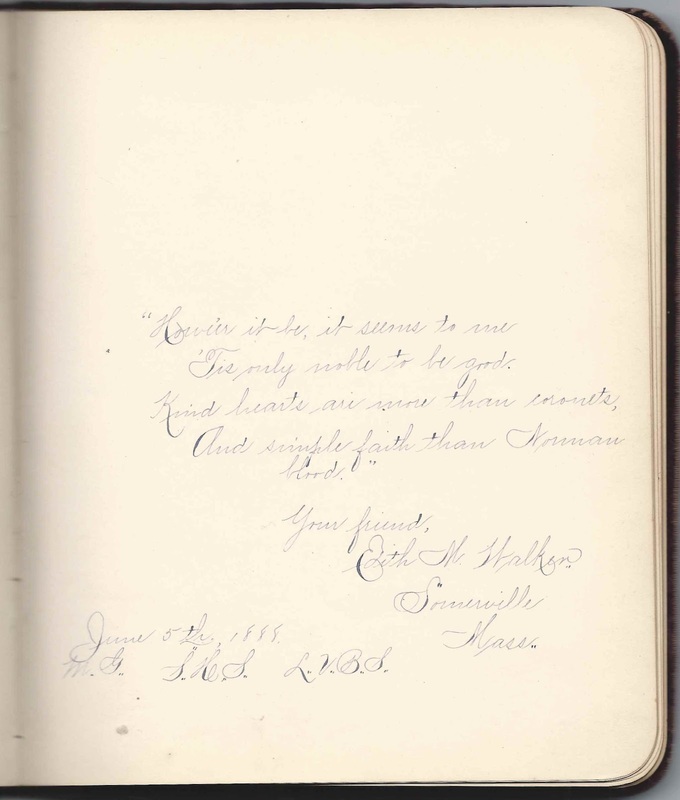 Edith M. Walker of Somerville, Massachusetts, inscribed a page on June 5, 1888 and mentioned three schools. M.G. ; L.V.B.S. and S.H.S., which might have been M.? Grammar; Luther V. Bell School and Somerville High School. The L. V. Bell School was named after Dr. Luther Vose Bell, who was a Superintendent at McLean Asylum from 1836 to 1856, with a later 4 month stint when the position was suddenly vacated upon the death of his successor. He had retired from his medical profession when the Civil War broke out but applied for a commission as a surgeon and was present at the Battle of Bull Run. Sadly, he died of illness on February 12, 1862. Dr. Bell was born at Francestown or Chester, New Hampshire, on 20 December 1806, the son of New Hampshire Governor and US Senator Samuel Bell and Mehitable Bowen (Dana) Bell. In 1834, Dr. Bell married Frances Clark Pinkerton, daughter of James and Sally (Wallace) Pinkerton. The Bells had seven children, at least three of whom died young. Frances herself died in childbirth in 1855 at Somerville, Massachusetts. Dr. Bell early on began to specialize in mental health and was one of the organizers of what is now the American Psychiatric Association. He was also a state representative in New Hampshire and an unsuccessful gubernatorial candidate in Massachusetts in 1852 and 1856 . If you're interested in at least one aspect of the life of this accomplished man, the 89 page "Memoir of Luther V. Bell, M.D., LL.D." is available at archive.org. It was written by or compiled by Rev. George E. Ellis. If you have a theory as to the identity of Jennie or information on any of the signers listed below, please leave a comment or contact me directly. Thanks! 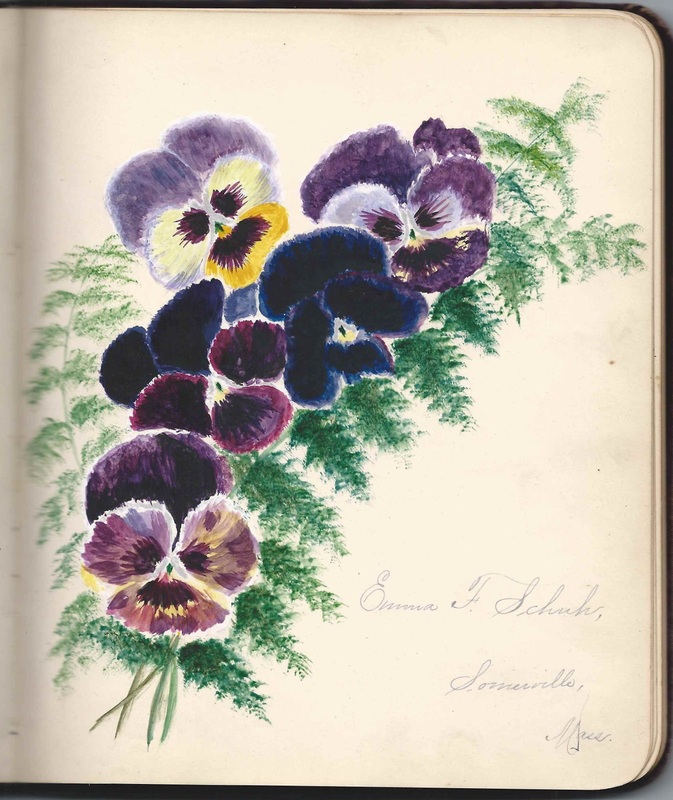 Emma Schuh of Somerville, Massachusetts; she painted a gorgeous spray of pansies. She was a teacher at the Luther V. Bell School at Somerville, Massachusetts. Lotta W. Tuttle of Pigeon Cove, Massachusetts, signed in December 1887. Pigeon Cove is located at Rockport, Massachusetts. Robert Bickford was the principal from Sept 1879 to the date of the Annual Report for 1883.
her father, Lucius Tuttle, was born in Connecticut and had something to do with the railroad, I think. both are close to Vinal Ave. I kind of lean toward Jennie Tuttle because the two Tuttles that signed were not Somerville residents, so more likely to be family visiting in Somerville, or being visited in Chelsea and Rockport. The other Chapman was Edith A. Chapman. There was a young girl age 10, at 42 Cross St, who could have been a fellow student. 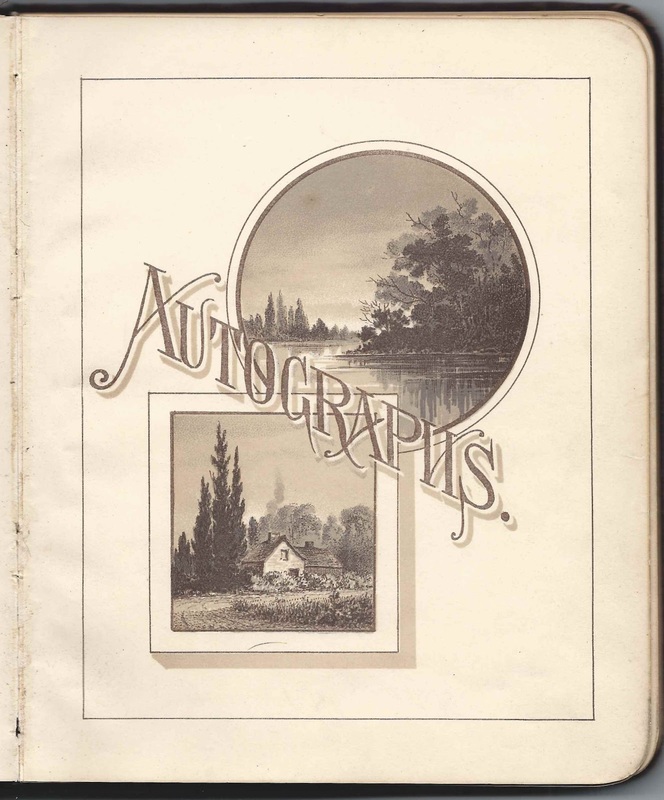 -- Unless "Jennie" didn't get any of her relatives to sign the autograph book. -- Then my theory goes out the window. Thanks, as always, Ed! I'm amending the post to direct readers to your comments.